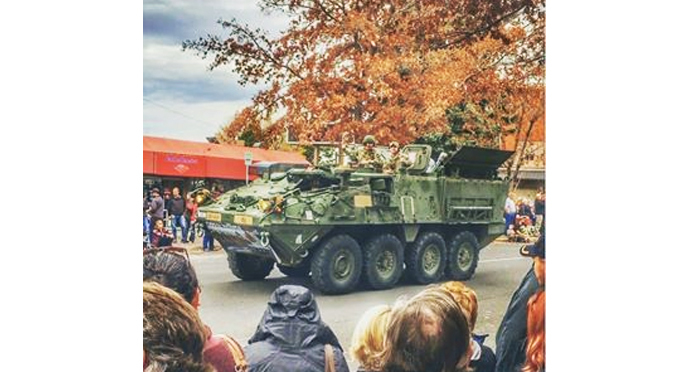 Veterans Day Parade of Bend has changed hands with Central Oregon Veterans Outreach (COVO) now producing the annual event honoring our military veterans and service members. The Parade is planned for November 11 at 11am in downtown Bend. Yesterday Bend Chamber of Commerce CEO Katy Brooks turned over the remaining funds donated by the late Steve Esselstyn to pay ten years of parade permits to JW Terry, Executive Director of COVO. In July the Chamber met with COVO about taking over the coordination of the parade and the handoff was finalized with a letter of agreement and the transfer of these funds. In the short time remaining leading up to Veterans Day on November 11, COVO will seek sponsorships from local businesses to cover costs to produce the parade. “It’s a great way for the community to say “thank you” to our Veterans by donating funds to preserve our town’s parade and meet their needs,” said COVO Board President, retired Brigadier General Dennis Merrill. In 2015 Steve Esselstyn, a Bend police officer and Veteran, wanted to ensure Bend never again forgot to honor our community’s Veterans. Esselstyn, who has since passed away, asked long-time parade planner Rabbine Harpell, owner of Azura Studio, to find an organization to administer his donation of $2,000 to pay the parade permit fee for 10 years. Harpell passed the torch to the Bend Chamber who agreed to organize the parade and hold Esselstyn’s donation. Harpell is continuing to support the parade by working now with COVO. “COVO is honored to be working with the community to honor Steve’s wish and ensure the Veterans Day Parade continues to be annual celebration”, said Terry. For information, to register for the parade, and to sponsor or donate for the parade, contact Kathy Skidmore at covo@covo-us.org or go to www.covo-us.org. COVO’s mission is to be an advocate for Veterans of all generations in Central Oregon, to advocate for homeless and at-risk Veterans and their families and provide outreach to the homeless community.